Today we are going to look at how to create an email list. Even if you already have one, I hope these tips will help you optimize what you have and I will share links all about the different services you can use and tips for getting signups. Want a more in-depth look? I wrote a totally FREE email course that dives way deep into email. It will be delivered right into your inbox. A third option is to offer options to people who subscribe. I just signed up for Feast + West’s email and you could choose a daily option of posts or a weekly newsletter type. I loved that and may plan to have that option in the future. 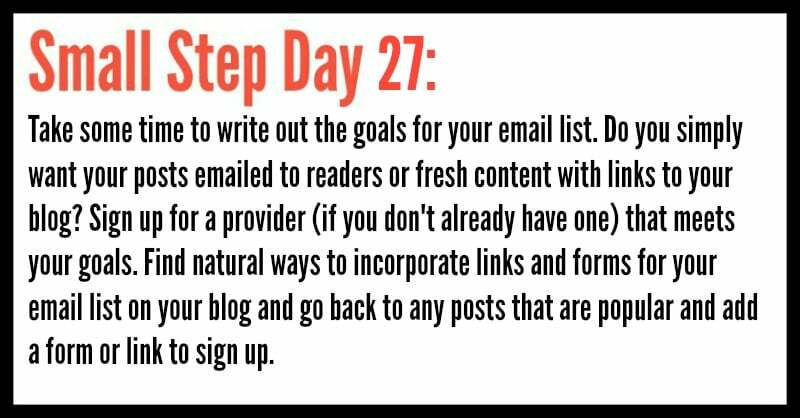 Consider what you want to get out of your email list before you put it together and that will help you decide what you want to do. I would again suggest the weekly (or bi-weekly or monthly) email with personal content because I think any time you can touch your community and be more personally connected, it’s a good thing. What better way to be personally connected than give them an email each week with content they won’t find anywhere else? There are several main providers for this: Mad Mimi, Aweber, Constant Contact, and Mailchimp. I’ll give you my personal thoughts and then send you to some other sources for reasons to choose one over another. This can be a huge decision because you DON’T want to switch after you have a lot of subscribers because you WILL lose some. Choose carefully! Mad Mimi– I have a lot of blogger friends who use this and love the way it looks and how it is set up. Here is a post from Tim Bonner about why he likes Mad Mimi, but after skimming it, I think I get more features in the free MailChimp account. Mad Mimi does have a great blog about using how to create an email list and useful tools. Aweber– Blog Tyrant swears by Aweber for all the features, but this one starts out as a paid service. I’m not at that point yet where I can pay for things that I don’t NEED for my blog, so I opted to go with something that is free up until a point. That way, when I hit the point, I will probably be able to afford it as a monthly cost. Read about why Blog Tyrant uses Aweber for email. Constant Contact– I won’t say much about this because I don’t know many people who use it. I signed up when I signed up for MailChimp and canceled right away. Why? Because they lived up to their name. I received no less than three phone calls the first week, plus like ten emails. That was a little too MUCH constant contact, if you know what I mean. If you want amazing customer service and like talking on the phone, this might be a great option. It, like Aweber, is not free. MailChimp– I have been using MailChimp for two years now and have found that the free version (so far) meets all my needs. It is easy to set up a pretty email with photos and html rich images. The interface is generally easy to use and the service is free up to 2000 subscribers and 12,000 emails/month. You can do split A/B testing with things like send times or email titles, which is helpful if you want to see when the most people open your email. You can click a box to have the analytics sent to Google Analytics so you can view what’s happening there as well. Because I use MailChimp, it’s the one I would recommend if you don’t want to pay. If you get to the point where you NEED to pay (over 2000 subscribers), then you SHOULD be making enough to defray that cost. Here is a great post with hacks you should be using on MailChimp. ConvertKit- When you need a little more from your email list and plan to monetize or sell books or courses or product, you may want to move to ConvertKit. (*These links to ConvertKit are my affiliate links!) There are advanced features like tagging that you won’t be able to believe you lived without. Let me give you an example. If you want to invite your current members to register for a webinar or sign up for something, rather than having to have them click to a page and give you their email AGAIN, they simply click a link within the email you send and a tag is added to their email. If someone buys a product from you, you can add a tag there, too. You also have the option to deliver your freebie through the very first email by way of a button that ConvertKit plugs in for you. This minimizes the number of emails that people receive from you and ups your confirmation rate. Since I moved my Create If Writing list to ConvertKit, I’ve more than tripled in size and my open rate has increased by like 15%. Read more about why you might want ConvertKit in this post! -Create an image with a permalink to your sign up in the sidebar. -Have a permanent form in the sidebar where people can sign up without leaving your site. -Use something like the What Would Seth Godin Do or Bottom of Every Post plugin to ask people to sign up in each post. -Mention the email list naturally in your post content with a link to sign up. -Find your most popular posts and embed a signup form into that post to capture traffic. -Have a landing page on your blog that is freestanding and tells people why they should sign up. -Use a plugin like Hello Bar that hovers up top that comes up asking people to sign up. My favorite two plugins for pop-ups are MiloTree and PopUpAlly Pro (I’m an affiliate for both). MiloTree is google friendly so you won’t have issues with mobile (Google doesn’t like pop-ups on mobile) and can grow your email or Pinterest or Facebook. PopUpAlly Pro actually does forms and pop-ups and has a ton of options. You can turn it on or off for desktop or mobile for optimal control! 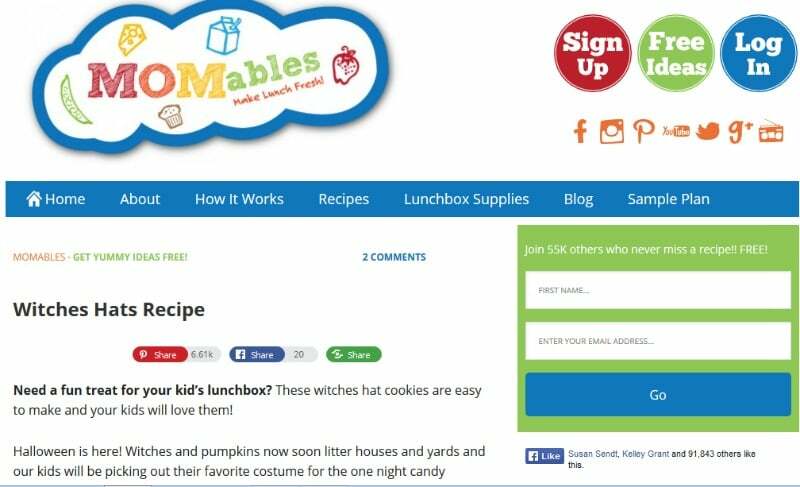 Laura Fuentes from Momables said that she generally tries to have at least 3-5 places that encourage signups to her email above the fold on her site. Check out this screenshot to see how she is a genius when it comes to naturally integrating this. Let’s play a game called: how many places does she ask you to sign up for her email? Don’t cheat and look below for my answers! Did you find them all? See where I have circled (or squared) them below. And guess what? THAT’S NOT ALL. If you click on “Sample Plan” you go to the same landing page as “Sign Up” and “Free Ideas.” These have great images and tell you why you want to sign up. There is an integrated form on that page for you. Plus, if you click “About” or “How It Works,” you read MORE about the email and also have a link right at the top of each of those pages to sign up. Momables is ALL about the weekly email and she has a paid plan and a free plan, which is a great idea for her brand and particular expertise, and she really knows how to get subscribers without readers feeling like they are getting hit over the head. Everyone loves free and everyone loves incentives. Check out almost every successful email list signup and you will find a free gift. Usually it’s an ebook, but I’ve seen printables and graphics and different offers. This sounds intimidating to some people, but don’t be! If you have content to create an email list, you have something valuable you can offer for free. You just have to find it. I took some time and created a collection of essays from my blog posts about the messy intersection of faith and life. You can buy it on Amazon for Kindle, or you can get it for free as a PDF when you sign up for my email. BOOM. I did take some time to format this, but otherwise, the content was there. What can you create to offer your subscribers? I wouldn’t wait until you have it fully together to start your email list, but once it’s done, you can also send an email to those already subscribed and give it as a gift. You don’t have to give a one-time gift either! I subscribed to Pinch of Yum and got a free cookbook AND every so often I get something else free, like a free 1-page guide to making food photos better on Instagram. Some people offer giveaways ONLY to subscribers. Think of what you might be able to offer that’s of value. See what other people are offering. I feel like whatever you offer shouldn’t be SO amazing that people sign up just to get it and then unsubscribe, but should be a nice incentive and kind of a bonus to receiving your email itself. Now it’s time for YOU to work on your email list! I hope this post is helpful wherever you are in the process of your email. If you have already mastered those things, you could work on your free gift, send out social shares (or schedule them!) 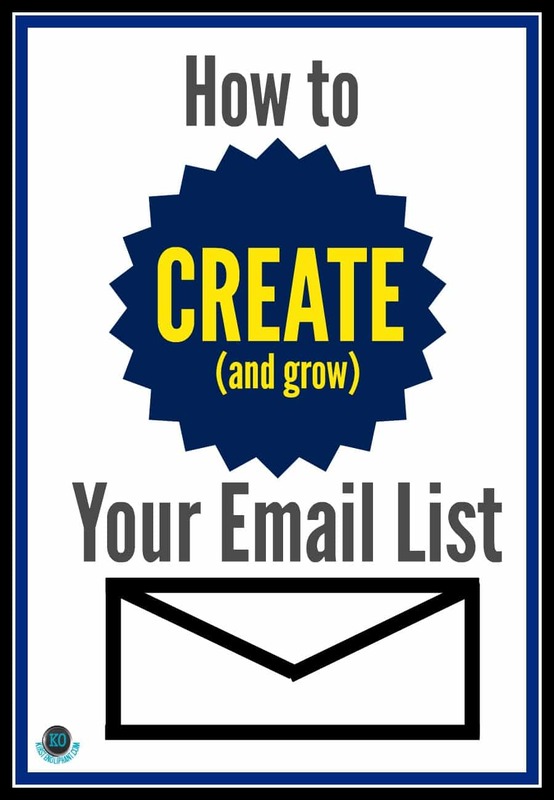 asking people to sign up, or work on growing your list through one of these 41 tips from Blog Tyrant on how to grow your email list. Do you already have an email list? What tips do you have? If you are just starting out, what questions do you have? And again, don’t forget you can sign up for a totally free email course! Creating a weekly email newsletter is on my list of things to do for November! I hope this is helpful as you do that! Email me if you have questions or want feedback. You could create an ebook from this 31 day series and then give that away as your freebie!